If your small business were audited tomorrow, would you be ready? If not, you’re probably not alone. It seems many small business owners struggle to keep their finances in order. We sat down recently with one of our business mentors, known for their excellent bookkeeping throughout 28 years in business, and asked for some tips on becoming more organized. Although some prefer an online method, or to use accounting software in attempts to ‘go green’, our mentor suggests that some small retail businesses might benefit from going back to basics and the good ol’-fashioned print-and-store method. Overall, good bookkeeping isn’t an intimidating process exclusive to those who are good with numbers, rather it’s a system you can create and follow as long as you’re dedicated. In fact, as our mentor points out, you really only need a box and a binder to make this system work. What you’ll need: a banker’s box, a binder, envelopes, and commitment. 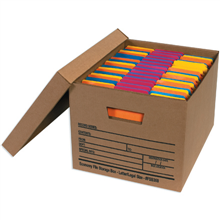 In a large banker’s box dated with your fiscal year, label large envelopes for each month and file accordingly. Print all of your bills for the month and separate them into the envelopes based on ‘bills to be paid’ versus ‘bills paid’. Mark each of the bills with the cheque number or the confirmation number; this labeling allows the bills to be reconciled at the end of the month with your bank statement. With a business checking account, your bank will send a monthly statement summarizing your transactions. In a binder with separated sections from January to December, keep a copy of each month’s bank statement. At the end of each month compare the contents of the envelopes in your box with the charges listed on the monthly bank statement in the binder to make sure they are the same. Even if you’ve paid for something with your debit card, print the confirmation or write down the confirmation number and how you’ve paid the bill to include in the box. This information is featured on the monthly bank statement and keeping track of small transactions is important with respect to accounting for everyday purchases. Keep track of your sales and label them as income as it accumulates. This tracking ensures that there are no sales that go unaccounted for. For expenses under $10, pay cash and keep the receipt. When you have accumulated a couple hundred dollars worth of these receipts, write a cheque and label it according to the category it belongs to (e.x. “supplies”). It’s important not to lose track of small daily expenses as they can add up quickly; you should know where your miscellaneous cash is going. Confirm what your bank charges for debits and deposits so that you can ensure you’re not spending unnecessarily on the convenience of using debit. Sometimes cash for small expenses can actually save you money as long as you keep your receipt. While the box & binder is a basic system and may not work for everyone, our mentor who owns a retail business found it very handy because she was able to simply hand over the box and binder to an auditor which eases the stress of an audit overall. Even after implementing a system like this however, it’s also a good idea to keep track of your finances with other resources as well. Many small business owners can benefit from organizing their finances with accounting software. Our mentor recommended Quickbooks, but there are other options to look into as well. Accounting software can generate financial reports so that you can literally visualize your sales and compare from year to year. Furthermore, it can help with sales forecasting to determine future sales based on current figures. If you’re looking for free online software to get started, Wave Accounting is also an option to explore. Our mentor advises asking other small business owners to recommend strong accountants in the area. When you aren’t sure of accounting practices yourself, it’s best you have an accountant who will look after your best interests while adhering to proper standards and avoiding the pitfalls of creative accounting. Ultimately your financial health needs to be observed regularly so that you make sound decisions in all aspects of your business. Better bookkeeping can seem daunting, but once you have a system in place, it’s easier to manage your finances and you won’t have anything to fear if an auditor comes to call. Additionally, you can contact our business development officer Tina Heathers to book a meeting to review your financial situation and bookkeeping practices via tina@wwcfdc.com.